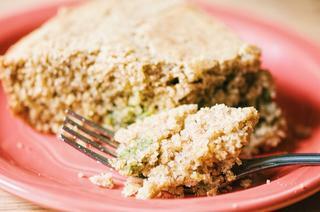 Subtly sweet gluten free buckwheat cornbread pairs beautifully with a savory swirl of basil pesto! Easy and delicious! I was in the mood for a baking experiment when I threw this delicious bread together. I wanted to make cornbread, but not the standard cornbread fare -- and boy was I happy with this creation! For this recipe, you can use homemade or store-bought basil pesto. But, I have included my recipe for basil & sunflower seed pesto which is what I use when I make this cornbread! Now if you've never paired these two things together before, you are in for a real treat! A bite of healthy and hearty buckwheat cornbread with its crisp crust coupled with the creamy deliciousness of basil pesto is a match made in heaven! Place a cast iron skillet or pie dish into the oven. Preheat oven to 425°F.While your oven and skillet are heating up, prepare your batter.In a large mixing bowl, sift your dry ingredients together.In another large mixing bowl, combine milk, butter, honey & egg. Mix until smooth.Pour your wet ingredients into your dry ingredients.Stir until well combined.Remove your heated skillet from the oven.Throw a dab of butter into hot skillet and swirl around.Pour cornbread batter into hot, buttered skillet.Using a spoon, place dabs of basil pesto evenly on top of poured batter. Swirl with a toothpick, or butter knife.Reduce oven temperature to 375°F.Bake pesto swirled cornbread for 23 minutes, or until firm and edges are beginning to brown.Remove and let cool for a few minutes before slicing & serving.Enjoy!